A stunning, bright, and spacious 3 bedroom 2.5 bathroom second and third floor duplex with a fabulous floor-plan, two oversized decks, and direct access parking. Having recently undergone a complete renovation with no detail overlooked, this inviting residence features a chef 8217;s kitchen with top-of-the-line appliances, custom high gloss white cabinetry, stone counters and a large waterfall island. The kitchen flows seamlessly into the dining area, which is flooded with light & leads out to the large back deck, perfect for indoor/outdoor entertaining. The living room with its beautiful gas fireplace & a powder room complete this level. Downstairs houses the luxurious master bedroom with walk-in closet & beautiful en-suite bath. Also on this level are two more generously sized bedrooms, one full bath, laundry, and great closet space, as well as access to the second back deck. 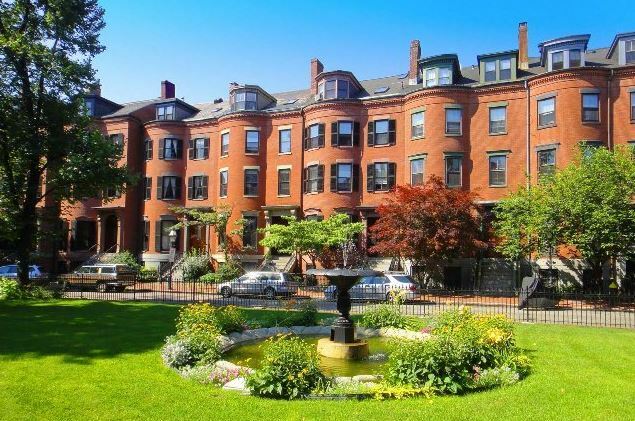 Perfectly situated in the South End, but only steps from Back Bay, this home is a must-see. ABSOLUTE WOW of a Renovation!!! This completely renovated penthouse in the vibrant South End has everything you 8217;ve ever wanted. Modern elegance is shown throughout starting in the living room with a gas fireplace, wall of glass doors and soaring ceilings. Enviable kitchen boasts Italian cabinetry, Thermador refrigerator, Gaggenau cook-top, speed oven and wall oven. Glass enclosed staircase leads to the second-floor. The master suite and bath are stunning and worthy of being on the cover of a design magazine. The views of the city are unobstructed. The large second bedroom has double closets as well as gorgeous views. Other features include central air, washer/dryer, custom lighting, Sonos sound system, California Closets, electric blinds in master bedroom, smoked glass via switch in master shower. Every single detail has been covered. This penthouse is just waiting for you to make it your own! 2015 new construction stunning 4 bedrooms 2.5 bathrooms penthouse offers high ceilings with crown moldings, wide open living & dining area perfect for entertaining with a private deck off the kitchen. Open chef's kitchen with granite counter tops, Thermador stainless steel appliances, gas cooking, kitchen island and designer cabinets. The top floor consists of three great size bedrooms and two full bathrooms. This unit has roof rights, central air, oak hardwood floors throughout, tankless hot water heater, in-unit LG washer and dryer. 678 Mass Ave is located steps away to South End's best restaurants, the newly proposed 150 rooms Alexandra hotel and all major highways. Two parking spaces side by side are included in the price. South End stunner! Sophisticated and sleek upper-level 2 bedroom/1.5 bathroom home. A+ South End location. This recently renovated Victorian rowhouse offers countless amenities while preserving its traditional charm. The open floor-plan features beautiful eucalyptus hardwood floors, fantastic natural light, and high ceilings. The chef 8217;s kitchen has stainless steel appliances, Carrera marble counters, gas cooking and a large island. Dinner party? Yes, please! The gracious dinning area is suitable for a large table. The huge master bedroom easily accommodates a king-size bed. The luxury marble bathroom features modern fixtures. The generously-sized second bedroom has a large closet. Stay cool in the central air-conditioning or head on up to the roof deck! Additional features include in-unit washer/dryer, additional deeded storage and professional management. The building is pet friendly. Step outside and enjoy all the great shopping and dining the South End has to offer! Sensational South End Penthouse! A fantastic location close to Columbus Ave, this wonderful 2 bed/2bath home is conveniently located moments to the Southwest Corridor Park and the Prudential center! Perched atop a well maintained 4 unit owner occupied building, this penthouse occupies the entire 4th floor and is sun flooded and boasts views over the treelined Worcester St. An open livingkitchen layout offers a wood fireplace, bow window, tall ceilings and hardwood floors. A generous kitchen has abundant cabinetry, ample counter space and gas cooking. The two bedrooms are split with a guest room with Murphy bed at the front with access to a full bath. The master bedroom located at the rear of the home has multiple windows, large closets and an attached full bath. Complete with a private roof top deck that has fabulous city views and 1 direct access parking space! In-unit laundry, storage, New HVAC System, tons of natural light in a fabulous South End location! Oversized garden-level duplex offering gracious dimensions with three bedrooms, three bathrooms, private outdoor space, and direct access parking. This 2015 gut renovation is complete with a custom kitchen featuring SubZero/Wolf appliances, induction cooking, and an expansive island/breakfast bar. Open to the kitchen, sits a 26' by 18' living and dining room equipped with a gas fireplace and a french doorway. The Master bedroom is anointed with a bay window, a walk in closet, and an en suite bathroom with a seamless glass shower and a double vanity. Two additional queen-size bedrooms and custom full bathrooms. Laundry room with stack washer & dryer and storage. New systems, radiant heat, AC, hardwood floors, security system, Nest, custom window film, fire supression system, and extra storage. Showings by appointment Friday 4/12 and Saturday 4/13. Open House Sunday April 14th. Sun-splashed penthouse duplex offers 3 bedrooms, 2 bathrooms, expansive private deck and wood burning fireplace. Upper level features vaulted ceiling and is flooded with natural light thru 12 windows and 3 exposures. Granite and stainless steel kitchen with ample storage including a pantry closet opens to dining and living areas offering the perfect floor plan for entertaining. King sized master bedroom and generous second bed each offer 2 exposures and double closets. Third bedroom is perfect for guest room, office or nursery. Great opportunity to live steps away from many of the South End 8217;s playgrounds, dog parks, restaurants, cafes and bars. Large private storage closet too. Rental parking options near-by. See agent. This won't last. Steps to Boston Medical Center. Charming bow front studio has hardwood floors, modern kitchen & bath and walk-in closet. Common laundry. New hot water heater 2017. New roof and copper gutters 2014. One pet allowed per unit. 12 month minimum rental. Currently rented for $1600 until Aug 31, 2019 - tenant may consider leaving early. Please EMAIL for showings. 2019 gut renovation on a tree-lined street in the South End!! This floor-through unit offers an an concept kitchen and living, two queen-sized bedrooms, and one full bath. The modern design is complete with a beautifully restored bay window, crown molding, and hardwood floors through. The kitchen features Jenn-Air appliances, custom cabinetry, and waterfall, granite countertops. Walking distance from all that the South End has to offer, and easy access to I-90 and 93.